February 13, 2016 – This week’s episode falls on the day we observe Lincoln’s birthday, so our time machine travels back to the final days of the American Civil War, as Abraham Lincoln turns his weary eyes forward to ending the rebellion and pushing for his vision of a new, reunited United States. The Great Emancipator does so by leaving the White House for his longest break since the war began, and spending them with General Ulysses S Grant’s command at City Point — known today as Hopewell — 130 miles south of the nation’s capital. 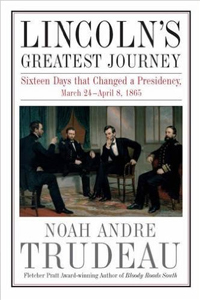 Our guide on this trip is Noah Andre Trudeau who brings us, Lincoln’s Greatest Journey: Sixteen Days that Changed a Presidency, March 24 – April 8, 1865 . Mr. Trudeau is the author of several books on the Civil war. His first, Bloody Roads South , which won the Civil War Round Table of New York’s prestigious Fletcher Pratt Award, and his fourth, Like Men of War — a combat history of black troops in the Civil War — earned the Grady McWhiney Research Foundation’s Jerry Coffey Memorial Book Prize. You can browse all his works at Lincoln1865.com.